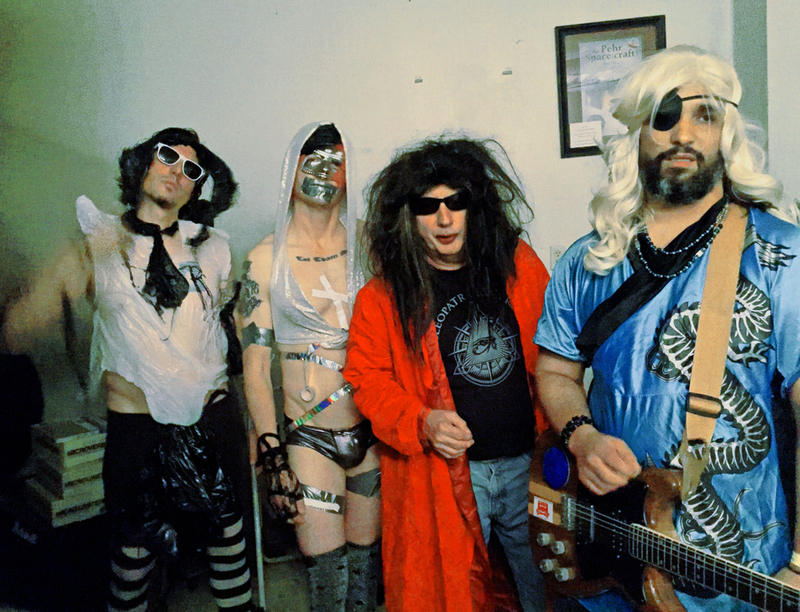 Three Days with DIY Pioneer Gary Wilson and Jimmy Whispers, "Underground Pop's Next Cult Leader"
The three final days of July 2016 were certainly ones for the proverbial books. And while there were several surprises between Thursday and Saturday, the memorable nature of those days was far from one of them. 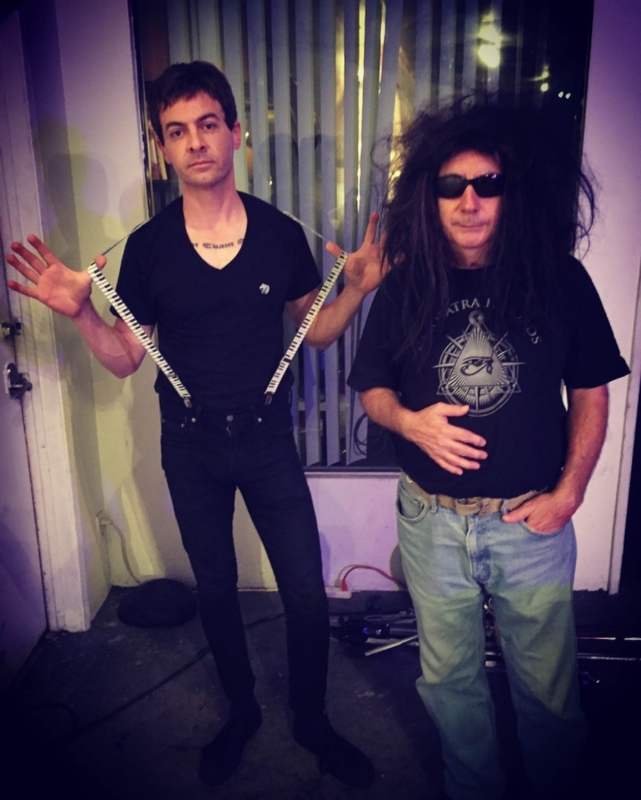 After all, the only thing to expect when hanging with DIY legend Gary Wilson and kindred spirit Jimmy Whispers (dubbed "underground pop's next cult leader" by Entertainment Weekly") is the unexpected, right? Following an afternoon of secret creative activities at Nutmeg that may or may have not included Jimmy Whispers contributing to the upcoming R. Stevie Moore/Gary Wilson collaborative album along with the help of my trusted colleague, recording engineer/producer Ryan Sinnott, it was time for Jimmy's live San Diego debut at the Hideout. Supported by Bujwah Strangers and Volar Records, Jimmy brought his unforgettable mix of song craft and showmanship to the fist San Diego crowd lucky enough to see him. It was clear to anyone present that his audience is only going to grow exponentially each time he returns to America's Finest City, and with just cause -- he truly does possess everything necessary for a long, profound career in the arts. Entertainment Weekly, Pitchfork, and Stereo Gum have been right on the mark with their praise of and attention on this brilliant artist. I'm including footage of Jimmy kicking off this special evening with his "I Love You". One of Jimmy's inspirations and colleagues, Gary Wilson, was on hand for the proceedings, warming up with a DJ set that included everything from John Cage to Dion to selections from his own new release on Cleopatra Records, "It's Friday Night with Gary Wilson" (my favorite track being "The Mermaid Song"). The following day it was time to load up the car and head north to L.A. Jimmy, Gary, and his Blind Dates (Joe Guevara on keys, Dean Reis taking care of guitar work, and I happily cover drum duty) had the distinction of playing the final weekend of the Echo Park all-ages venue, Pehrspace. The performances were a milestone indeed, doing justice to a space and group of people who have a well-deserved reputation of bringing innovative, underground performances to adventurous and appreciative attendees, regardless of the year those attendees were born. Jimmy's set was rousing as ever, and the perfect complement to Gary Wilson's unfettered onslaught of theatrics, tempered all the while with solid musicianship. As a representative from Gary's label Cleopatra Records pointed out, there didn't appear to be anyone in the enthusiastic crowd over the age of 30, and that Gary clearly has an entirely new generation of fans at this point in his career, spurred no doubt by a recent Earl Sweatshirt sample of his music, a Jimmy Kimmel Live appearance, continued name checking by Tyler the Creator, and opening slots for Ariel Pink, Black Lips, and Dan Deacon, as well as live appearances in L.A., New York, Chicago, Europe, and other corners of the globe ready for his unique blend of off-kilter, jazzy soul searching. Gary, of course, was making "bedroom pop" long before there ever was such a genre, and it's wonderful to see time and smart young audiences catching up with his important body of work, which continues to expand every year. DJ sets from the ultra-talented Mild High Club and TOPS rounded off the evening, and their presence added significantly to the sense of community, importance, and creative spirit of the event. Lost & Found Film Club provided the perfect, thoughtful visual complement to the evening's performances with their projections, and the combination of all these creative forces added up to a fitting send off for this incarnation of Pehrspace. The following day found us beating the L.A. heat once again, emerging post-sunset and reconvening at Non Plus Ultra for the music/performance art/comedy mashup phenomenon that is Super Tight. The event continues to grow exponentially, and as a rule, sells out. This particular installment was no exception, and that such off-the-beaten-path creative offerings were so well-received by a large and youthful crowd is truly a testament that L.A.'s music and performance art scene is alive, well, inspiring, and actually growing. Jimmy delivered a power-set of musical, wonderful Whispers weirdness, and then things got really weird when Gary contributed a 15-minute avant-garde performance, aided in the oddly compelling proceedings by the aforementioned Mr. Whispers, Native Fauna's Cameron Murray, and Yours Truly. It's all a bit of a blur at this point, though I feel certain there were wails of anguish, mannequin head kisses, woeful references to homesickness and broken hearts, and perhaps a bit of floor scuffling as well. 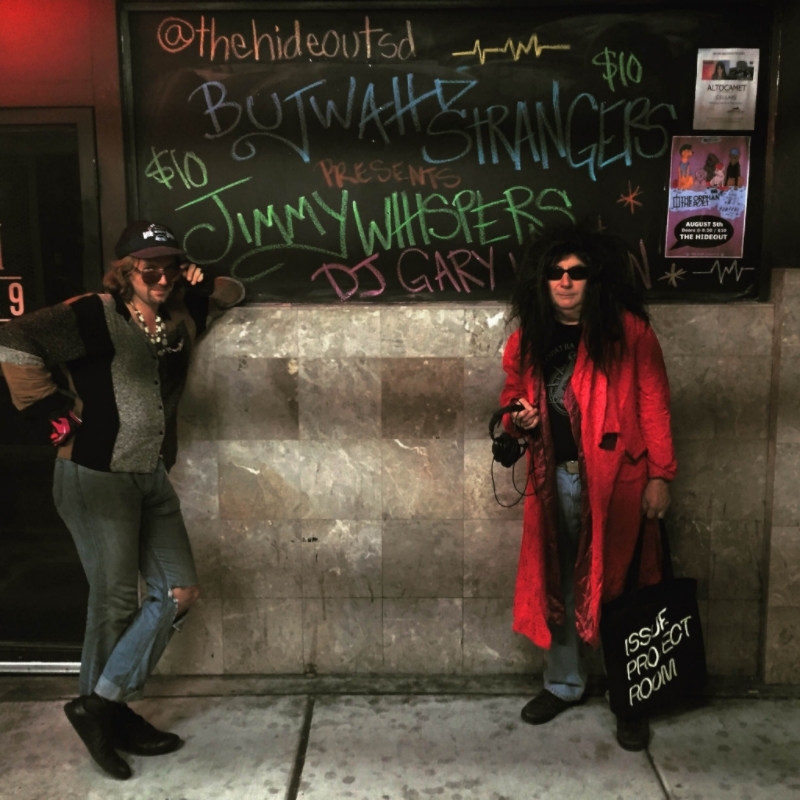 But, then again, par for the course when we're talking about Jimmy Whispers and Gary Wilson, right? The evening also featured music from talented up-and-comers Sloppy Jane and the Memories, as well as a Colleen Green DJ set. On the comedy end of things, Andre Hyland, Jay Weingartern, Josh Fadem, and Johnny Pemberton all contributed to the evening, creating a feeling of a theatrical event rather than a standard gig. It was absolutely a privilege to be involved with something that vibrant, and a fantastic way to cap the a long weekend with Jimmy and Gary. I will, of course, continue to update on any and all adventures involving recordings, live performances, and more with the distinguished Mr. Wilson, and I have a strong feeling that our paths will be crossing with that of Jimmy Whispers again soon.